Success will find you when you put great work towards it. Not hard work, not long hours, but great, quality work. 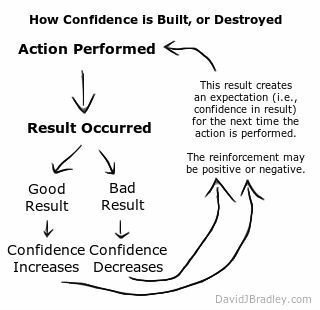 Perform brilliantly and you will build confidence and recognition. Opportunities and money will follow from there. It’s not difficult to understand this in retrospect, or a hypothetical. But how about when you’re waiting around for success to pop up? Not so simple to believe in anymore. You will face hardships, tempting shortcuts, political games, and flat-out depression. It’s tough to stay positive, hopeful, patient, and trusting. All of your hardships can negatively affect your confidence in finding success. Entrepreneurs especially experience this. As a small business owner, lows tend to be lower (fortunately, highs tend to be higher). It can be lonely to be an entrepreneur, even with a team backing you. So many businesses fail because their anxieties build up. They want to be everything to everyone. They skim on profit margins and unique qualities to gain customers. If you believe in your business, stick with it, and success will find you. Yet, when success hits, things don’t change much. You still need to keep doing what you’ve been doing. You still need to keep striving. The same rules, instincts, and hope that got you to where you are will help you maintain or grow your success. The most important thing is to realize that success isn’t always synonymous with money. In fact, it almost never should be. It’s up to you what defines success, what gives you that personal satisfaction. When success finds you, you will know, and you will love it. To me, success is time and financial freedom. Nothing exorbitant, just freedom. Is it fair to say defining success as synonymous with money is often misguided?